The event, which was held at the historic Goldsmiths' Hall in the City of London, provided a unique platform to job seekers to network with international and local companies looking to fill more than 60 positions in all areas of the industry. What is more, the aspirants wanting to join the gem and jewellery industry also got the opportunity to witness a discussion amongst a brilliant panel of experienced industry professionals; and were able to spend quality time in one-on-one meetings for career coaching. Mehdi Saadian, GIA London School Director opened the career fair with a welcome address. This was followed by a panel discussion on “Job Success in Today’s Market,” moderated by GIA President and CEO Susan Jacques. 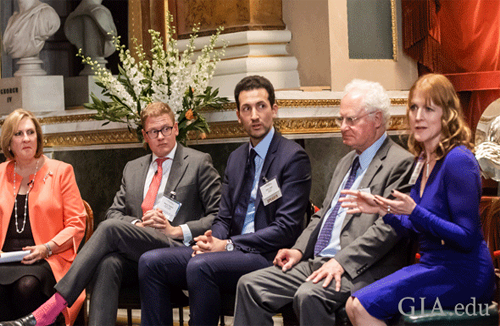 Peter Buckie, director of Jem Services; Harriet Kelsall, founder and chair of Harriet Kelsall Bespoke Jewellery; Faris Saif, associate at Sotheby’s; and Henry Deakin, director of sales at Deakin & Francis all shared insights gleaned from their extensive experience. The discussion was wide-ranging covering a gamut of points. At its conclusion, Deakin discussed the importance of passion. “You need to consider your own heritage. What are your personal values and what matters to you? You’re going to be at work for a long time so you may as well do something that you love,” he said. “The success of GIA’s London Jewellery Career Fair is due to the gracious participation of the recruiters and volunteer career coaches, the expertise of the panellists and the collaboration of the Goldsmiths' Hall,” GIA said in appreciation. The next GIA Jewellery Career Fair will be in Carlsbad, CA on October 11, 2019. Pic Cap: The opening panel, “Job Success in Today’s Market.” From left: Susan Jacques, GIA president and CEO; Henry Deakin, director of sales at Deakin & Francis; Faris Saif, associate at Sotheby’s; Peter Buckie, director of Jem Services; and Harriet Kelsall, founder and chair of Harriet Kelsall Bespoke Jewellery.